“Star plant” because of the typical shape of some species within the genus. A genus of usually solitary, highly variable plants, flattened, globose or elongated to shortly columnar, mostly covered with flaky scales (trichomes), some with spiny scales, with well defined ribs or with very elongated tubercles (A. caputmedusae). Spines present or absent depending on the species. Flowers diurnal, self sterile, apical, funnel-shaped, yellow, some species have a red centre, pollinated by bees. Fruits globose with persistant scales, dehiscent when ripe. Seeds brown, helmet-shaped, light. Seed dispersal by hydrochory (streaming water) or myrmecochory (by ants). 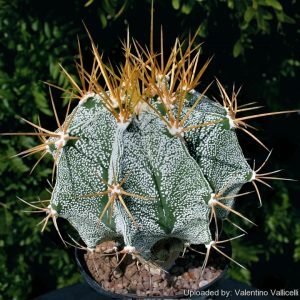 – Astrophytum – includes species with yellow flowers and fruits having an apical dehiscence (A. myriostigma, A.
dehiscence or irregular and indehiscent (A. asterias, A. capricorne, A. coahuilense). – Stigmatodactylus – Includes the only tuberculate species of the genus (A. caput-medusae). and clay alluvial soils, bed of dry lakes or in ravines of calcareous rocks, together with other Cactaceae and Bromeliads (Hechtia spp.). The xerophytic vegetation allows species to take advantage of a good period of sunshine. In this region, the annual temperature does not vary much, but the rainfall is very irregular. The winter is characterized by high thermal amplitudes (differences of temperature between day and night), and a few frosty nights are not uncommon. Mexico (Coahuila, Durango, Guanajuato, Hidalgo, Nuevo-León, Querétaro, San Luis Potosí, Tamaullpas, Zacatecas), USA (Texas).